Who are ‘antifa’ activists and how do they operate? Demonstrators marched in Chicago on Sunday to protest the alt-right movement and to mourn the victims of the rally in Charlottesville, Va. The rise of white supremacist groups since the election of President Trump has fueled another aggressive militant force: brigades of black-clad left-wing activists who believe peaceful protest is not potent enough to stamp out fascism. The willingness of these professed antifascist activists to embrace violent opposition to the far-right stands in stark contrast to the traditions of pacifism, civil disobedience, and vigils that the left normally venerates. It has also given critics like Trump an opening to blame both sides, even after a woman was killed while protesting a white nationalist rally last weekend in Charlottesville, Va.
“It feeds into the narrative of the white supremacists who regularly portray themselves as victims,” said Robert Trestan, executive director of the Anti-Defamation League’s Boston office. He said he wants Bostonians to ignore a far-right rally planned for Saturday and march elsewhere. “Leave the bigots alone in the Boston Common with no audience and no one to hear their hateful rhetoric,” he said. But antifascist organizers argue that white supremacism is so dangerous that it has to be confronted directly with force or it will spread further into the mainstream. The coded language of the white supremacist playbook has been displayed in abundance since Charlottesville. 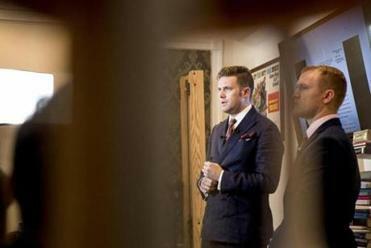 Many point to the spread of Nazism in Germany in the 1920s and ’30s — a period, they argue, that shows how rational argument and parliamentary government were not enough to stop the rise of Hitler, said Mark Bray, a lecturer at Dartmouth College and author of “Antifa: The Anti-Fascist Handbook,” due out next month. Such arguments have been echoed by many on the far right after Charlottesville. “If it weren’t for antifa, it would’ve been just a bunch of white dudes in a field with torches, but people went in and provoked it,” said Joe Biggs, a speaker and activist from Austin, who worked until recently for Infowars, a website run by the conspiracy theorist Alex Jones. Antifa, pronounced an-TEE-fa, traces its roots to the leftists who battled fascists in the streets of Italy, Germany, and Spain between World War I and World War II, and to the militants who fought skinheads in Britain in the 1980s and neo-Nazis in Germany after the fall of the Berlin Wall, Bray said. More recently, some have taken part in the Occupy Wall Street movement and the massive protests that have greeted Group of 20 summits in Europe. They’ve also been linked to violent clashes with right-wing groups in Berkeley, Calif.; Portland, Ore.; and other cities. Many are anarchists, socialists, and communists who reject the notion embraced by liberals that hate speech is protected by the First Amendment and should be debated in the public square. Rather, they seek to block fascists from organizing or speaking out about their politics, by using physical force or online attacks, Bray said. Bray said the influence of such thinking can be seen in the growing belief on college campuses and among liberals that hate speech should not be countered through protests, but shut down entirely. That notion that it’s “OK to punch a Nazi” was crystallized by a video that went viral of the white supremacist leader Richard Spencer being attacked by a black-clad protester at Trump’s inauguration. “Certainly, the perspective has become more prevalent — the notion of ‘no platform for fascism,’ that it’s essentially not to be debated, but opposed as illegitimate,” Bray said. Many antifa activists hide their identities, saying they fear being targeted by the police or white supremacists. Miguel, a 35-year-old antifascist activist who splits his time between Washington, D.C., and New York, said the movement seeks — by any means necessary — to stop fascists from threatening immigrants, LGBT people, and minorities. “We’re going to make sure it’s harder for them to exist than the marginalized groups they’re trying to attack and terrorize,” said Miguel, who asked that his full name not be used. 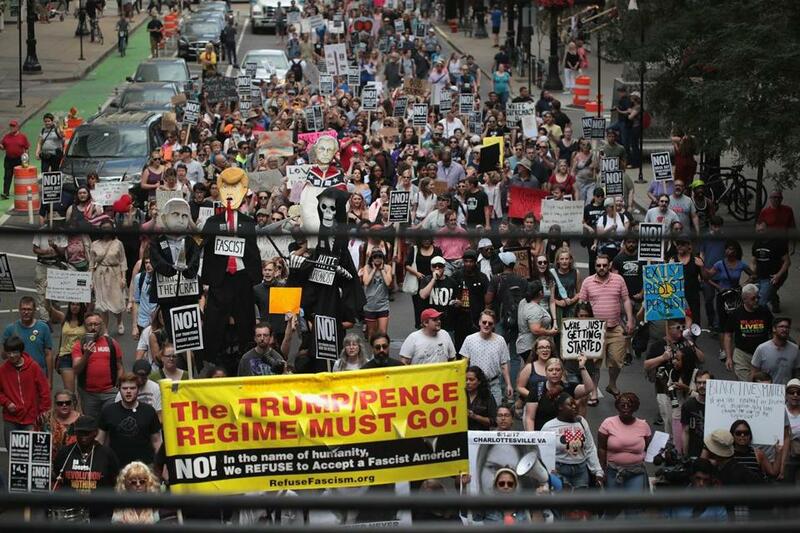 The left-wing militants have vowed to show up on Boston Common on Saturday if far-right groups gather there for a “free speech rally,” as planned. “We believe violence is actually a pretty good tool to use against people who don’t agree with our worldview,” said a spokesman for the Boston Antifa group, who identified himself only as Cermen. Still, he noted that there were no clashes between right-wing activists and antifascists during a similar rally on the Common in May. Boston police have vowed to keep both sides separate to prevent violence.